I do like naturally flavoured gummy sweets. These Gourmet Sweets from Candy Kittens have natural ingredients and colouring, and are gluten free. Each gummy sweet is a pink and blood red striped decapitated kitten's head. Maybe I should be writing about this around Halloween? Anyway, on opening the packet there was a fantastic sweet and fruity Eton Mess smell of blackcurrant, strawberries and cream. On taste there was a brief flavour of the carnauba wax coating these gummies have to stop them sticking together in the packet, followed by a mixture of fruity flavours and creaminess that makes a good Eton Mess. 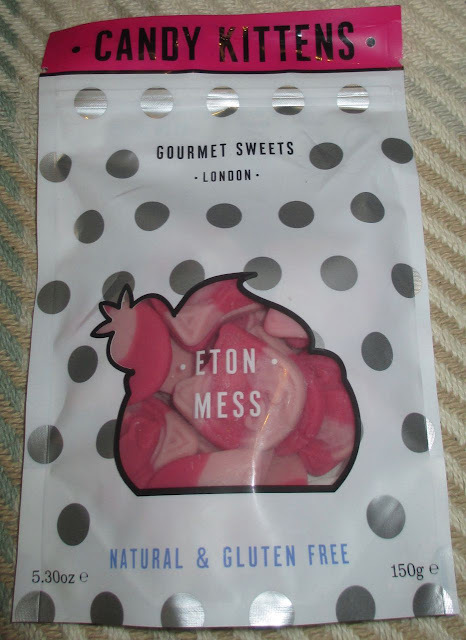 These Candy Kittens Eton Mess were certainly bursting with natural fruity flavour, and I'd recommend them for a fruity gummy treat. 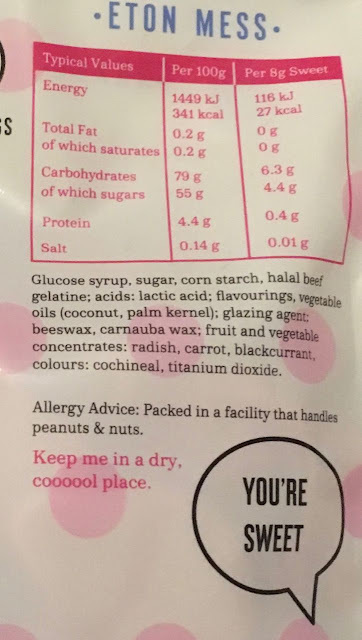 The 150g re-sealable packet has 8g sweets that have 27 calories, 0g of fat, 0.01g of salt and 4.4g of sugar. See photograph for ingredients.